It always amazes me when I arrive at any Italian motorcycle swap meet that the motorcycles and parts that we consider rare or chance sightings in the USA, are so incredibly common here. Mostra Scambio’s (what these events are called in Italian) are held literally every weekend all over Italy. An integral part of this culture that loves motorcycles and prefers cash transactions when possible, the vendors come out in droves. Novegro is the biggest of the winter meets, held the same week in the same town as the giant EICMA motorcycle show, for me it's a great "2-fer", one week of travel at off season airfare produces two great events. 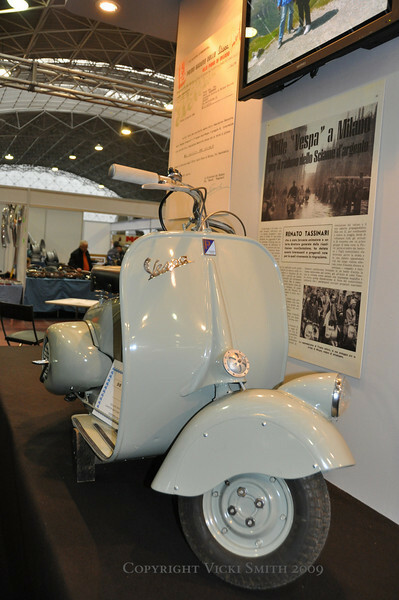 Most meets are some mixture of antiques, cars and motorcycles, and this one is as well, but this is motorcycle week in Milan and that's what the focus is here. Novegro has been going on for 29 years and it's huge - 12,000 square meters of indoor vendors and over 60,000 square meters outside, no wonder you can see and find just about everything here if you look hard enough. Join me for a look at Novegro Mostra Scambio, 2009.